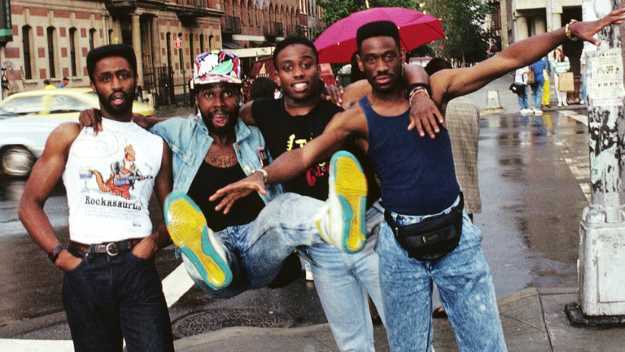 Living Colour also happened to be a band comprised of four African-American men in singer Corey Glover—fresh from his tour of duty on the set of Oliver Stone's Oscar-winning film Platoon—as well as Reid on guitars, drummer Will Calhoun and original bassist Muzz Skillings. Their songs touch upon issues that continue to plague us to this day including gentrification ("Open Letter (to a Landlord)"), racial paranoia ("Funny Vibe") and drug addiction ("Desperate People"), delivered with the urgency of their peers in hip-hop like Boogie Down Productions and Public Enemy. Will Calhoun: My first boss was Harry Belafonte. I was still working for him when Living Colour started. And Harry heard about us and asked me what was the band like, what did it sound like. And I was thinking, "Man, I can't give this guy a Living Colour tape, I'll likely get fired." I was 19. But I gave him the tape, and he called me into his dressing room and told me what we were doing was very important. So Harry Belafonte, who wasn't just my boss but a hero of mine, to endorse Living Colour and tell us how important this music that we're doing was, I knew this was it. But that was early on, and for him to come up and say that to me…I called him almost every year for ten years in a row thanking him for that endorsement. And Harry was very supportive when I told him I wanted to do Living Colour full time. He loved the tape I gave him, which was a board mix from one of our shows at CBGB's, and he told me, 'Man, you have to do this.' Any ambivalence I had about whether or not Living Colour was going to work melted away after what Harry said to me. Corey: "Glamour Boys" was written by all four of us. We were seriously in the era of the velvet rope. There was a time when certain clothing stores had one of those ropes—Fiaricci in Soho being one of them. And it catered to that club kid set, which was somewhat very exclusive. But at the same time, it was all a façade. I think all of Vivid was trying to tear down the façade of status and class, especially with a song like "Glamour Boys." Yeah, you may wear the finest clothes in the world, but you're still living in your room with your parents. You're in every hot spot in town, but you still take the subway home.